Because of the light-teachings the last days, today has been super easy to spot when I choose fear and immediately dropping it. It feels wonderful to be this alert. 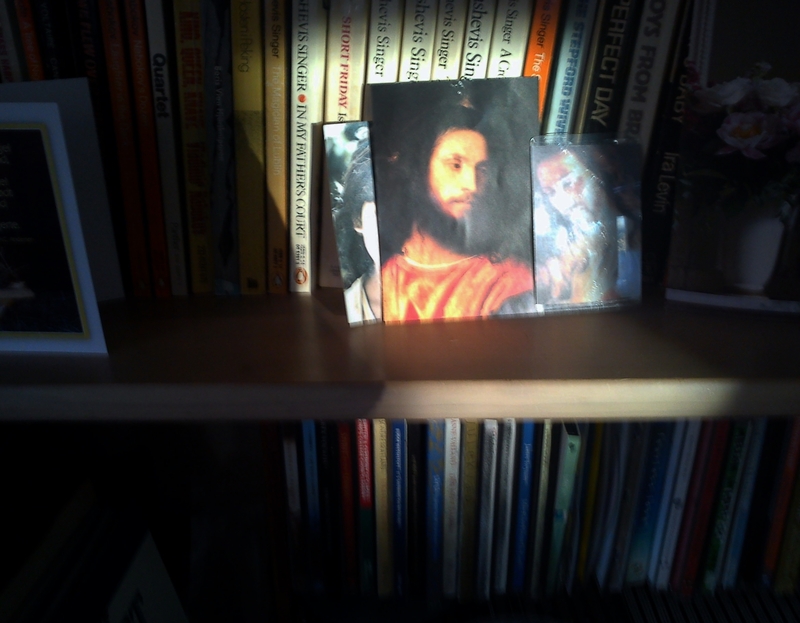 Sitting in a dark room later,when suddenly a small photo of Christ is lit up – and nothing else- from an unknown source. I can’t spot from where it comes. It stays for about 5 minutes. Some 10 years ago I had a psychotic episode in the Mall. My daughter was with me, but suddenly I could not see her. In that moment, I KNEW that my daughter had been abducted by evil men and now she was in their power. The images in my mind were so vivid, the feelings so horrifyingly “real” that there was no doubt. I alarmed the security guards to look for her everywhere. They seemed to believe the seriousness of the situation. Paralyzed from fear I ran down into the library and told the librarian of my abducted daughter. Then I walked home and found my daughter, and exploded in tears. It became clear to me that a very early memory had risen to the surface, and I had projected it on her. This night I had a dream that my daughter had been abducted in a dark wood again. The screaming for help was very loud – and there she came, calmly walking out of the wood! Nothing at all had happened – except in my imagination. In the dream I clutched her to me, frantic, and while I was doing that, I could observe how good it felt to express all that agony – and how special I felt while doing that. Of course! No judgment at all about it – just a calm realization that I did not need this justification for expressing agony any longer. It has taken some time for this story to move through the mind and be observed and recognized as a dream in the split mind of the Son of God – but it HAS been recognized now. The symbol of my daughter walking peacefully out of the dark wood allows me to see that it HAS been healed. The peace and joy in seeing this is indescribable. Next dream: I am skiing – with the-soon-to-abdicating Pope Benedict and my daughter! We are great friends. I am enjoying the symbol of the deputy of the ego’s god in the world – too old and tired now, and in my mind, (as in the world) retiring. Talking this into the recorder,lying in bed, there is an infernal noise from outside. I walk out on the balcony: two huge black surveillance helicopters fly very low in perfect equal distance from each other, making a parallel path over the sky. One week ago I would have been freaked out and seen it as a sign of “surveillance” from a vindictive god.” Really, I would – or the ego would, and I would have identified with that thought of being guilty and scared. Never before has it been shown so crystal clear that the world is a stage and that we are the stuff that dreams are made off. As a stage designer I could fully enjoy the details of the old Russian Theater with its 3 levels – and the main operative level, (is the correct word string loft?) was of course populated with people with lowest status. The musical delicacy of the details and symbols were intensely satisfying: in one scene the audience to a horse race are in flesh and blood (Anna among them) watching Vronsky and others horse racing across the stage. Before they enter, Anna’s tension is mirrored in her way of fanning herself – and the rush-rhythm of the fan is mirrored in the sound of the galloping hoofs thundering across the stage. In the moment when our attention is with the riders, we see that the audience are now seen as painted figures of the set: 2 dimensional, painted on the walls of the theater. The metaphors of the stage…some time there is like a little mini-theater inside the theater: a very intimate little room with a bed and a person sleeping. All – I say all – the details are exquisite, symbolic and meaningful. In some scenes we are looking into the area of the public – now empty – where one actor is looking out, and the beautiful old-fashioned stage lights are framing them. And the choreography! Dance is woven into every scene, and makes it even more clear that we – the humans – are all choreographed – but it is done with such beauty and truth that we hardly notice it. In the last scene the nature takes over the stage – this is such a wonderful image of what the Course calls “the Real World.” My heart opened and a I could sit in darkness and allow myself to have that experience as the credits rolled and nobody were moving and disturbing. W-pI.56.3. (28) Above all else I want to see differently. 2 The world I see holds my fearful self-image in place, and guarantees its continuance. 3 While I see the world as I see it now, truth cannot enter my awareness. 4 I would let the door behind this world be opened for me, that I may look past it to the world that reflects the Love of God. In the movie “The Truman Show” , a brilliant movie using the metaphysics of The Course to show us how we all live in an illusion, our hero – the Son of God/Truman/Jim Carrey has capsized, and quite literally reached the horizon in the Studio (“the World.”) He finds himself in the corner of the world – he touches the painted sky – and discovers a long ladder. He climbs it, opens the door at the top – and there meets him his true love he thought he had lost. Looking out in the dark, a very big dark car drove by, stopping outside my house. Instant fear. The entrance light went out. -and some appearance are fun! It’s 2:50am, I have been releasing stuff for an hour or so – continuing the healing process I had yesterday evening with Stacy Sully. It feels like a shift has happened. Hearing this, I burst out: “This is freedom.” Stacy says: “Yes, this is freedom. You are the truth, you are the way, you are life. He meant it when he said it, and that is Who we are. When we encompass that, we see through everything. We only make things real when we choose to buy into what we think we’re seeing. Leelah: So I just acknowledge what she is feeling and believing, but remain in Truth. Stacy:”Yes, that’s what He was doing. He SAW people without their design and stories, He saw what was there in Truth, that’s how He healed.And we have that same power, we have the same Christ.So that is what we can bring inside for ourselves. That’s what we honor and accept.That’s what unconditional Love is. It accepts everything as it is, and so everything remembers what it is. You are free – it is your birthright to meet with love every part of yourself. Every part of the truth you are. That is quantum forgiveness right there. Leelah: Seeing the appearances for what they are, seeing through them -and remaining in Truth. Stacy:Right. Thats the power of it. I have known this for years – and still it felt like seeing it with completely new eyes. The insight had moved from the mind to becoming embodied: a felt truth. I went up at 2:50 to take a break from the process. Started to look at the last part of Kieslowky’s “Red”, when the fire alarm started to sound. I immediately went in to guilt:”I shouldn’t have looked at TV, I should have meditated/read and so on “- I noticed how paralyzed I felt from fear, and only now, writing this, do I realize how strong the ego’s fear of its god is, and how it lays in waiting to have a chance to pop up. I believed that energies from within me had turned the fire-alarm on- since there was nothing burning around me…then I at last had the thought to walk around. I looked down the stairs into the therapy room and saw light flaring up. Ran down the stairs: I had forgotten to blow out a thick candle (log-light?) and the wax had started to melt and burn. This is a new little shaman. 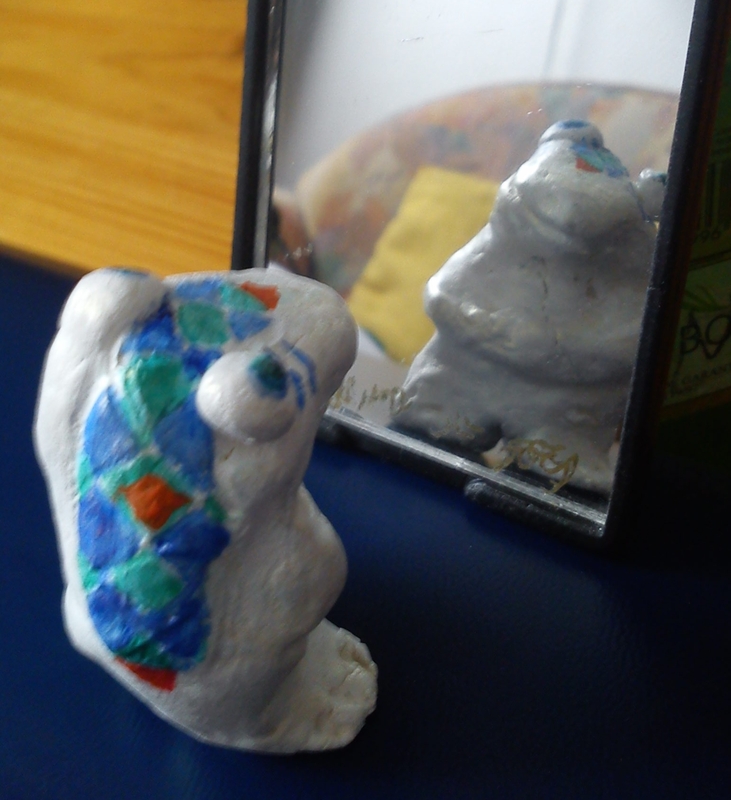 I have made it for Chris, who helped me see through the false self with such patience and care. The shamans just come: I sit down with the clay and the intention to bring into being a little shaman with healing properties. This one looks reptilian, and judgment quickly popped up: “reps are bad.” But I have learned to trust what comes. This shaman had a clear pattern on his back – I “saw” the colors: blue/green/orange – colors of duality/polarity. It looked like a costly snake-skin. The “shells” are going to be lined in gold, when I have bought new paint. And his body is pearly shiny white. As I looked at him, my eyes moistened over. 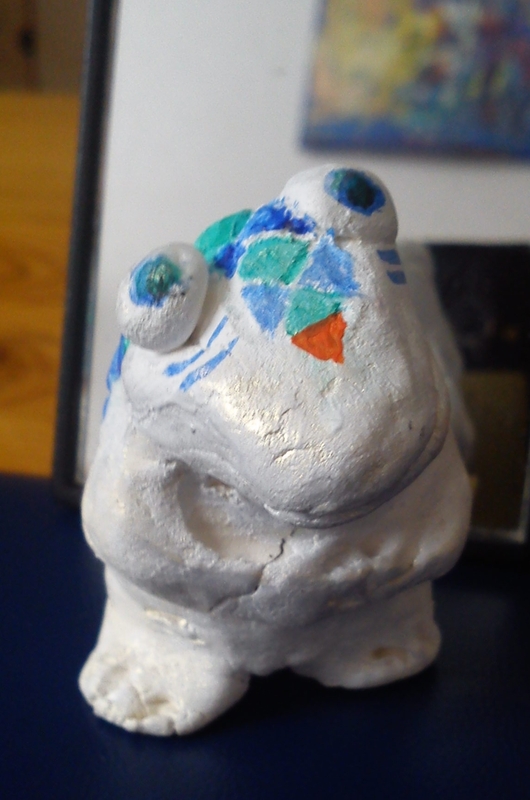 I saw that this one had transcended the reptilian astral form – had gone through cycles of incarnation, being steeped in violence and abuse,and now knew and taught what was real: Love. Just finished half an hour sharing/Sedona-session with Cary. I had just received an email telling me that a delivery of Baking Soda was – for the 3rd time by this firm – delivered to a wrong address. They told me to pick it up by the other address, or else I would have to pay big fines – and they did not send me ONE mail about this: they sent 5! So I got the message: please look at this. What is it that you hold on to? I found a fear of having to pay for other peoples’ “faults” – i.e. rapes, abuse, lies, demands, insanity as a child. They told me I deserved it, I believed them. I believed them -I had held on to the belief that all this was real, and defined me. Yes, the acts happened – but all the stories ABOUT why they happened and what they said was NOT real – and my identity as “the one who all this happened TO” was not my true identity. As that fear came bubbling up, I saw that it is my belief that I have to pay – my belief in “my” sinfulness and guilt attracted these violators.And it is that belief that still manifested “outside” of me: I projected it on this firm. But now Cary asked if I could enjoy what I felt? and I could! It’s just feelings! It’s just anger! Could I allow myself to enjoy the anger? Sure! And how! Enjoy is such a simple word. Enjoying anger allows me to see that it is my perception that is warped and absurd -and that is the very definition of the ego. It lasts for quite a beautiful non-existent time. And it reminds me about a recent beautiful encounter I had in town with a man I thought was begging. He looked like he had slept outside for a long time. He had a crutch.He had a paper cup at his side- and I dropped some coins in it – but it was not empty, it had coffee inside. I exclaimed “oh NO!” and he took my hand in both his, kissed it and smiled at me. It felt like Jesus had taken on a REALLY convincing costume. I felt high for hours after that meeting.